A big advantage of using a SLR (Single Lens Reflex) or DSLR (Digital Single Lens Reflex) camera is the ability to swap lenses to suit the job at hand. If you need to take shots of your buddies at a football game, you can use a telephoto lens to capture their finest moments from afar. And when you see a beautiful flower on the way back to your car, just replace the telephoto lens with a macro lens and you are set! The flexibility of SLR and DSLR cameras cannot be denied. You can literally swap dozens of different lenses either from your camera's manufacturer or third-party manufacturers like Tamron and Sigma. Even if the lens is an old hand-me-down, it will work as long as the lens is compatible with your camera's mount. However, one problem of such flexibility is the high cost. Lenses are not cheap and that's a fact. Good lenses can cost anywhere from a thousand dollars to a few thousand dollars. Budding photographers will discover that the cost of the SLR or DSLR body is nothing compared to the cost of buying lenses for the camera. Even cheap telephoto and wide-angle lenses can cost hundreds of dollars each. So, is SLR or DSLR photography out of reach of all but the rich and professional photographers? Not exactly. Canon and Nikon made DSLR photography affordable with their ground-breaking EOS 300D and D70 DSLR cameras. Both cameras (and their successors) were sold with kit lens at less than a thousand dollars, with street prices even lower than that! But what about lenses? 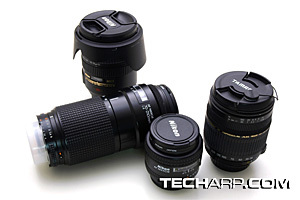 Well, the good and bad news is both Canon and Nikon are now making cheaper lenses available. This is good news because you can now buy these lens at a lower price. The bad news is these cheaper lenses generally have a poorer build. The use of polycarbonate and plastic optics, instead of metal and glass, make these lenses lighter and cheaper. They are less rugged as a result and may produce softer pictures with less contrast. While these cheap lenses are good for amateur photographers to play with, eventually you will probably want to move up to the professional-grade lenses. Unfortunately, these lenses continue to command a significant price premium. So, what can you do if you want professional-grade lenses at bargain prices? Nothing much, if you want them brand-new. But if you do not mind used lenses, why... you can get your hands on professional-grade lenses for about the same price consumer-grade lenses! In this guide, we are going to take a look at the pros and cons of buying second-hand lenses and what you should look for when you buy second-hand lenses. As these lenses are often no longer covered by the manufacturer's warranty, it is very important for you to inspect them properly before parting with your money. We hope this guide will help you make informed choices about second-hand lenses and allow you to have an enjoyable experience with them. The primary advantage of buying second-hand lens is of course, LOWER COST! You can save a lot when you buy second-hand lens. Depending on the condition of the lens, you can actually buy it for less than half the price of a new one. It also gives you the ability to try out lenses that you might never be able to afford new. 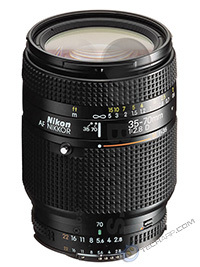 For example, you may not be able to afford a new Nikon AF 35-70mm f/2.8D lens that will set you back about US$560. But if you keep an eye out, you can actually get it second-hand for less than US$250. That's a saving of over US$300! Buying used lenses also has the advantage of reducing your loss when you decide to sell them. You will lose less money selling off used lenses than you would new lenses. This allows you to be a little more daring in experimenting with unknown lenses that you might otherwise not consider at all for monetary reasons. Finally, sellers often throw in freebies like a filter or a hood or free shipping. This adds value to the purchase and saves you not only money, but also the expense and hassle of getting your own filter or hood. Of course, for there to be a silver lining, there must be a cloud as well! Buying used lenses can be a rather risky endeavour. When you buy a brand-new lens, you can be assured that it will be in perfect condition. However, when it comes to used lenses, the mileage varies. If you are lucky, you may find a well-maintained lens that works just like a new lens. On the other hand, you could end up with a lens that has a sticky diaphragm or loose elements or worse, is infected with fungus! There is also the issue of warranty. Most used lenses are no longer covered by the manufacturer's warranty, unless they are relatively new or come with long warranty periods like the 6-year warranties offered by Sigma. This is no small matter as repair work done out of warranty often cost a lot of money. 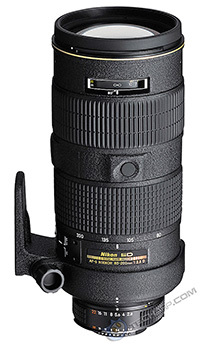 For example, a focusing problem on the Nikon AF-S 80-200mm f/2.8 D required the replacement of the front ring element which cost me almost US$400. So, if your used lens is faulty, you will most likely have to pay a hefty price for its repair, unless it is still under warranty. You should also be aware that certain warranties cover only a specific country or region. If you buy used lenses from overseas, be aware that doing so may deprive you of coverage under that warranty. In addition, buying used lenses from online auctions opens you up to the risk of fraud. You will have to be really cautious about buying used lenses from people with limited or poor reputation. Of course, using an escrow service helps prevent that but please note that escrow services are not cheap. So, buying cheap, used lenses online will be a bit of a gamble even if you cover yourself using protection schemes from eBay, PayPal or your credit card company. This guide aims to be a comprehensive guide on how to buy used lenses at bargain prices. To do this, we will have to work out different ways to counter the issues associated with buying such lenses. If we take the necessary precautions, buying used lenses can actually be a low-risk and enjoyable experience. This guide is here to help you with that. Let's start at looking at how to examine used lenses. When you are looking to buy a used lens, you should first learn how to look for the various problems that may be a problem with such lenses. Some may be minor points, others may be serious issues. Let's take a look. In certain cases, the package will even include a hard or soft case. Heavy telephoto lenses will also come with a tripod collar. So, check and make sure everything is there. While you can do without cases, you may not want to deal with a heavy telephoto lens that does not come with a tripod collar. A replacement tripod collar is neither cheap nor easy to find. The most common items to get lost are the manual/documentation, purchase receipt, warranty card as well as the box. The loss of these items are not a real problem, except when it comes to selling off the lens. They do somehow improve the lens' value, at least in the resale market. This is partly because the loss of such items may suggest that the lens (especially if it's relatively new) was stolen. The warranty card is important if the lens is still under warranty. Without it, you will find it hard, if not impossible, to claim warranty if the lens develops problems after you purchase it. If the warranty card is not produced at the time of purchase, you should consider the lens as out of warranty and bargain down the price. The purchase receipt or any other proof of purchase is also important as it will help with warranty claims, particularly for parallel-imported (gray market) lens. The receipt will also prove the age of the lens. There have been many occasions where a seller has misrepresented the age of the lens, especially if the lens is still new. By declaring that it is still covered by the manufacturer's warranty, the seller can ask for a better price than he could have if the warranty actually lapsed. The lens caps as well as the hood are also common items to go missing. 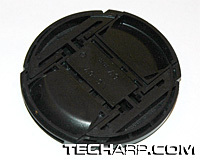 A missing front lens cap will be a problem since it protects the front lens element. Replacing it will not be cheap as original front lens caps can set you back anywhere from US$10 to over US$100, depending on the size and model. You can buy generic lens caps but generally, they do not look quite as nice, or work as well as the original lens caps. The rear lens cap is actually less of a problem than a front lens cap. Yes, it is important to protect the rear lens element from scratches. But because you will always have one lens attached to the body, you can use its lens cap as a replacement since all lenses (for the same mount) use the same lens caps. 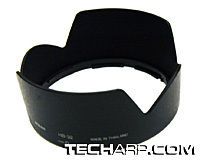 It will only become a problem if you want to sell the lens and need to protect the rear element during delivery. Including an original rear lens cap with the lens also improves its market value. 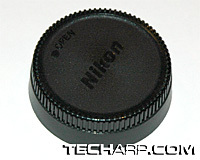 Compared to the front lens cap, rear lens caps are a lot cheaper. You should have no problem finding one for about US$8. Depending on the lens, a missing hood may or may not be a problem. For lenses that are prone to solar flares, the hood will be a necessity and you will need to buy one to replace the missing hood. Otherwise, you can actually make do without one - by using your hand! 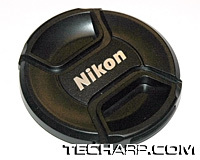 Just like the front lens cap, replacing the hood will not be cheap. Original hoods can cost anywhere from just US$5 to over US$500! Generic hoods will, of course, cost much less. But they won't look as nice, although they should work just as well. This is why it's better to buy lenses with their original hoods, even if you don't need them. You can do without them, but having them will definitely improve your lens' resale value in the future.